HAVE YOU SEEN YOUR GALAXY LATELY? Sadly, according to an article in Cosmos magazine, it would be difficult for an increasing number of people to give a positive response to this question because more than one-fifth of the World population, one-half of the European Union population, and, most disheartening of all, two-thirds of the U.S population—can no longer see the starry arc of our Milky Way galaxy stretching across the night skies! 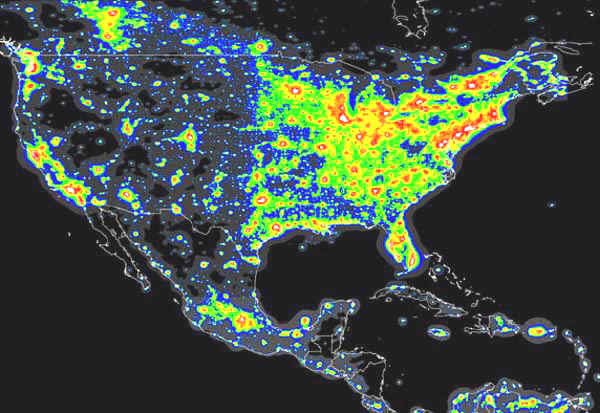 The cause, of course, is the ever-increasing light pollution from expanding urban areas. On the U.S. map, note the dramatic contrast between the eastern and western halves of the United States. For more images of our world at night, visit “The Night Sky in the World” website. 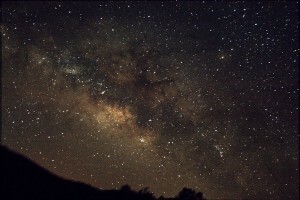 Fortunately, at Casitas de Gila Guesthouses we are truly blessed, because with the exception of nights with a full or near-full moon or a rare night of total cloud cover, we can see our Milky Way galaxy every night. Indeed, the Casitas have exceptionally clear, dark skies most of the year, as you will see on the Casitas de Gila Observatory Light Pollution Map. You can monitor our dark skies on our website. The Clear Sky Chart is updated daily. The starry skies of Spring are one of my favorite times of the year for stargazing, especially during La Niña years, like this year, when there are even fewer clouds, less precipitation, and greater sky transparency and seeing due to lack of turbulence in the atmosphere. During the months of February, March and April the celestial firmament of the Milky Way is especially exciting as a myriad of beautiful constellations and objects are on display for naked eye and binocular viewing. Our Milky Way galaxy is classified as a Barred Spiral Galaxy, having a disk-like shape measuring some 100,000 ly (light years) across and averaging about 1,000 ly in thickness, except in the central core region where there is a thicker bulge. A light year is the distance travelled by light in a year, traveling at a speed of 186,000 miles per second. Considering that the distance from our Sun to Earth is about 93 million miles, and that it takes just 8.3 minutes for light to travel this distance, it can be quickly seen that such galactic distances are incomprehensibly immense. Although estimates vary, recent research places our Sun and planet Earth about 26,000 ly from the center of our galaxy, and centrally located within one of the main spirals making up the disk. One can visualize our place in our galaxy by first taking two dinner plates and placing them together to represent our disk-shaped galaxy. Now, sandwich a sheet of paper between them and draw a circle on the paper by tracing the edge of the plates. Having done so, our Sun and Earth’s position would be a dot placed on the paper a little more than half way out from the center of the circle on the sheet of paper. The Milky Way in June, seen from Casitas de Gila Guesthouses, looking towards the bright central core of our galaxy in the region of the constellations Sagittarius and Scorpius. Thanks to Brian Miller for the photograph. At night, all of the stars seen with our naked eye lie within our Milky Way galaxy. Estimates of the number of stars in the Milky Way range from at least 200 billion to as many as 400 billion. With the naked eye on a dark night in clear skies the average person can see, at most, only 2,500 of them at any given time and place. Of these, one notices immediately that the majority of them are concentrated in a broad band arching across the sky. Why are they concentrated in this band? Well, going back to our plates and paper analogy, if you consider yourself on your dot called Earth and look parallel to the plane of the paper, you are looking parallel to the diameter and greatest dimension of our disk-shaped galaxy, and hence through the greatest number and density of stars. On the other hand, if you look out perpendicular to the plane of the sheet of paper you are looking through the thinnest dimension of the galaxy and, hence, through a fewer number and less dense concentration of stars. The Winter Milky Way looking away from the core towards the edge of our galaxy. That's the constellation Orion just above our windmill. Thanks to guest Alex Himes for the photo. Now, if one factors in the Earth’s rotation, plus its annual orbit around the Sun, one can understand that the view that one has of the starry arc of the Milky Way overhead will change according to the time of night and season of the year. As a result, when you look up at the arc of the Milky Way, sometimes you will be looking more towards the central core of the galaxy, and at other times you will be looking away from the core towards the outer edge. One of the best things about viewing the Milky Way during the weeks surrounding the Spring Equinox (late February through April) is that you are able to view most parts of the Milky Way on the same night. In early evening, for example, the constellations of Orion, Taurus, Auriga and the Pleiades are still high enough overhead in the sky to give a marvelous view of the arc of the Milky Way looking away from the core and towards the edge of the galaxy. As the evening wears on, however, first Taurus and then Orion slowly sink and begin to disappear below the western horizon. Show over. But wait! If you now look to the eastern horizon, you will notice that the sky is getting brighter just as the first stars in the head of Scorpius and then the bright red star Antares in the middle of its body emerge over the horizon, heralding the return of the Milky Way arc once more. And if you can stay up or set your alarm for a couple of hours later, you will find that the arc is once more high overhead, but much brighter than before, because now you are looking towards the central core of the galaxy. In recent years numerous photographs of the Milky Way have become available on the Internet. A really great panorama showing the entire Milky Way is one produced by Digital Sky LLC, a company specializing in quality photos of the heavenly realm. Produced from 4×5 inch film photographs of large areas of the sky taken at naked eye magnification, this incredible 360-degree composite panorama of the arc of the Milky Way Galaxy shows an entire cross section of the galaxy just as you would view it from earth. Also at this site are other pages showing the relative position of the various constellations in this panorama, as discussed in this blog. As we’ve shown above, several of our guests have been able to take really great photos of their own of various parts of the Milky Way during their stay with us using a digital camera mounted on a tripod with short time exposures. If you have such an interest and plan to be a guest at Casitas de Gila Guesthouses at a time when our skies are darkest, be sure to bring your equipment and give it a try. A full moon rises over Casitas de Gila Guesthouses. 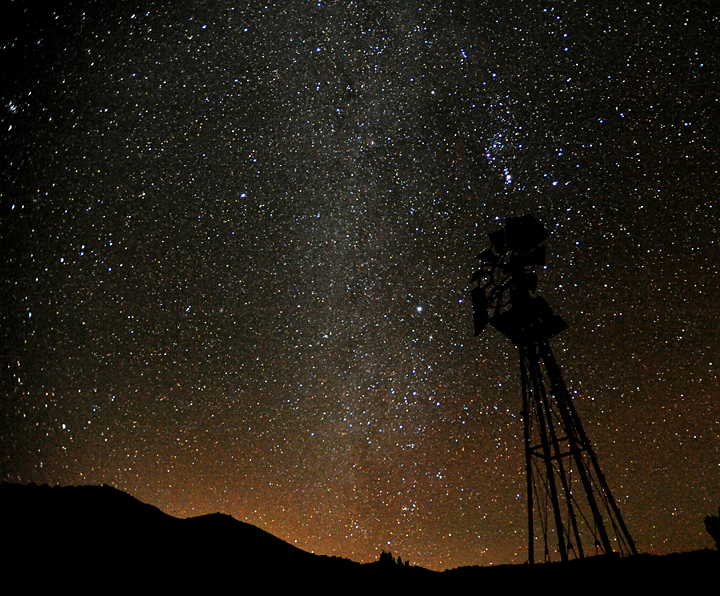 There are numerous places around Casitas de Gila Guesthouses for observing the stars. Our dedicated observatory spot some 600 feet from the Casitas offers undisturbed and unobstructed viewing in all directions. For less serious viewing, many of our guests enjoy the stars while sitting in front of their Casita’s outdoor chimenea fireplace; others prefer to view the stars while relaxing in our outdoor hot tub. Whatever your choice, the starry skies of the Milky Way in Spring are one of Nature’s finest gifts, waiting to be enjoyed by you at the Casitas, and one which you will treasure forever. 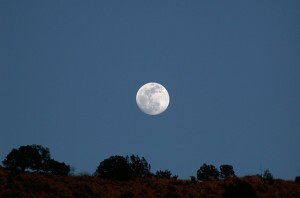 If the only time you are able to plan your trip to Casitas de Gila Guesthouses is during a full moon, no worries! You can sit outside and enjoy the moon rise over Turtle Rock. This entry was posted in astronomy, stargazing and tagged astronomy, light pollution, Milky Way, night sky, stargazing. Bookmark the permalink.